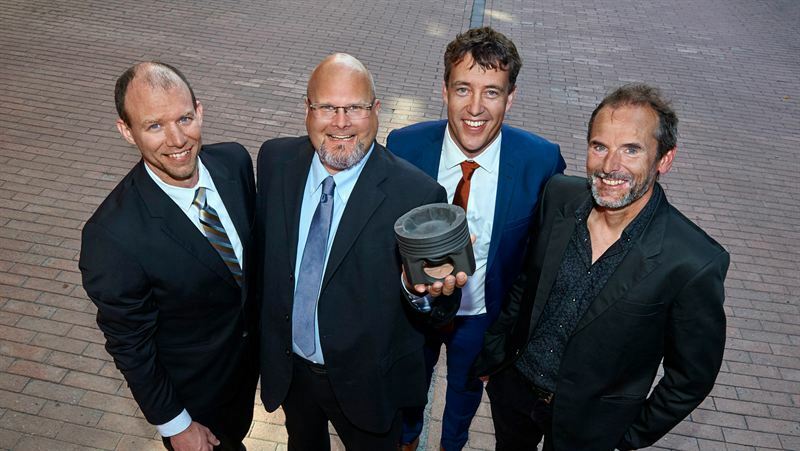 Engineers at Volvo receive award for piston crown design that improves the way fuel burns inside the cylinder and reducing emissions. The Volvo Group commercial division’s new truck engines are more fuel efficient as a result of their intelligent piston design. Waves have been added to the piston crown to improve the use of oxygen. The engineers behind the innovation have now received the Volvo Technology Award 2017. When the flames collide, they compete for the available oxygen. At the same time, the oxygen in the centre of the combustion chamber is never fully used. “For this reason, we wanted to identify a method of leading the flames into the centre of the combustion chamber to make better use of the oxygen there,” explains Jan Eismark. The result of their work was the inclusion of ridges or waves in the piston crown. The piston has six of these ridges and the injector, which is located in the centre of the cylinder at the top of the piston, has six orifices to ensure the fuel is sprayed between the ridges that lead the flames into the centre. This innovative, intelligent method is now in use in the latest engines from the Volvo Group and brings advantages for both customers and the environment. The more efficient combustion process it delivers has halved the quantity of soot particles emitted by the engine and has also reduced fuel consumption by an average of two percent.